This article is about the Washington, D.C.-based institution. For similar organizations, see Carnegie Institute. The Carnegie Institution of Washington (the organization's legal name), known also for public purposes as the Carnegie Institution for Science (CIS), is an organization in the United States established to fund and perform scientific research. The institution is headquartered in Washington, D.C.
Beginning during 1895, Andrew Carnegie donated his vast fortune to establish over 20 organizations (see The Carnegie Confusion) around the world that now feature his surname and perform work involving topics as diverse as art, education, international affairs, world peace, and scientific research. The organizations are independent entities and are related by name only. In 2007, the institution adopted the public name "Carnegie Institution for Science" to distinguish itself better from other organizations established by and named for Andrew Carnegie. The institution remains officially and legally the Carnegie Institution of Washington, but now has a public identity that describes its work more precisely. Beginning during 1895, Andrew Carnegie contributed his vast fortune toward the establishment of 22 organizations that presently feature his surname and perform work in such topics as art, education, international affairs, peace, and scientific research. During 1901, Andrew Carnegie retired from business to begin his career in philanthropy. Among his new enterprises, he considered establishing a national university in Washington, D.C., similar to the great centers of learning in Europe. Because he was concerned that a new university could weaken existing universities, he opted for an independent research organization that would increase basic scientific knowledge. Carnegie communicated with President Theodore Roosevelt and declared his readiness to endow the new institution with $10 million. He added $2 million more to the endowment during 1907, and another $10 million during 1911. By some estimates, the value of his endowment in current terms was $500 million. As ex officio members of the first board of trustees, Carnegie chose the President of the United States, the President of the Senate, the Speaker of the House of Representatives, the secretary of the Smithsonian Institution and the president of the National Academy of Sciences. In all, he selected 27 men for the institution's original board. Their first meeting was held in the office of the Secretary of State on January 29, 1902, and Daniel Coit Gilman, who had been president of Johns Hopkins University, was elected president. The institution was incorporated by the U.S. Congress during 1903. Initially, the president and trustees devoted much of the institution's budget to individual grants for various topics, including astronomy, anthropology, literature, economics, history and mathematics. Among the researchers who received individual grants were American physicist Albert A. Michelson, paleontologist Oliver Perry Hay, botanist Janet Russell Perkins, Thomas Hunt Morgan and his "fly group", geologist Thomas Chrowder Chamberlin, historian of science George Sarton, rocket pioneer Robert H. Goddard and botanist Luther Burbank. The institution also funded archaeological research by Sylvanus Morley at Chichen Itza. As directed by Robert Woodward, who became president during 1904, the board changed its practice, deciding to provide major funding to departments of research rather than to individuals. This allowed them to concentrate on fewer topics and fund groups of researchers in related areas over many years. Starting in 1907 the Institution maintained the Tortugas Laboratory on Garden Key, Florida (today Fort Jefferson National Monument), under the direction of Alfred G. Mayer. Andrew Fire, who with colleagues elsewhere researched RNA interference, for which he shared a Nobel Prize during 2006. When the United States joined World War II, Vannevar Bush was president of the Carnegie Institution. Several months before, on June 12, 1940, Bush had been instrumental in persuading President Franklin Roosevelt to create the National Defense Research Committee (later superseded by the Office of Scientific Research and Development) to mobilize and coordinate the nation's scientific war effort. Bush quickly housed the new agency in the Carnegie Institution's administrative headquarters at 16th and P Streets, NW, in Washington, DC, converting its great rotunda and auditorium into office cubicles. From this location, Bush supervised, among many other projects, the Manhattan Project. Further, Carnegie scientists cooperated with the development of the proximity fuze and mass production of penicillin. As of June 30, 2014, the Institution's endowment was valued at $980 million. Expenses for scientific programs and administration was $98.9 million. As of January 1, 2018, Carnegie Observatories Director John Mulchaey and Carnegie Embryology Director Yixian Zheng jointly serve as interim co-presidents following the retirement of Matthew P. Scott. 6) Plant science at the Department of Plant Biology (Stanford, CA). A montage of scientists who work at the Carnegie Institution for Science. Carnegie investigators are major researchers of astronomy, Earth and planetary science, global ecology, genetics and developmental biology, matter at extreme states, and plant science. The institution has six research departments: the Geophysical Laboratory and the Department of Terrestrial Magnetism, both located in Washington, D.C.; The Observatories, in Pasadena, California, and Chile; the Department of Plant Biology and the Department of Global Ecology, in Stanford, California; and the Department of Embryology, in Baltimore, Maryland. Department of Embryology, Baltimore, Maryland The Department of Embryology was founded during 1913 in affiliation with the department of anatomy at The Johns Hopkins University. It has pursued innovative experimental studies directed toward a fundamental description of human development. In an attempt to foster a closer relationship with the Johns Hopkins Department of Biology, during 1960, the Department relocated from the medical school to the Hopkins Homewood campus at 115 West University Parkway. This initiated a new research emphasis on understanding fundamental developmental mechanisms at the cellular and molecular level. A major focus of the research has been the role played by genes during embryogenesis. The research of the department has developed widely used experimental methods. The department has funded a vital postdoctoral program that has allowed it to train generations of biologists. A shared graduate program with the Johns Hopkins Department of Biology has helped enhance the work of the department. Embryology Department faculty have been appointed Investigators of the Howard Hughes Medical Institute since 1987. The Maxine F. Singer research building is a facility that has housed the department since 2005. It is located on the Johns Hopkins Homewood campus at 3520 San Martin Drive. The Department of Embryology is recognized as among the top research centers in cellular, developmental and genetic biology. Three researchers were awarded Nobel Prizes for work done while at the department: Alfred Hershey, Barbara McClintock, and Andrew Fire. In addition to the Department of Embryology, BioEYES is located at the University of Pennsylvania in Philadelphia, PA; Monash University in Melbourne, Australia; the University of Utah in Salt Lake City, UT; and the University of Notre Dame in South Bend, IN." Until the 1960s the department's emphasis was human embryo development. Since then the researchers have addressed fundamental questions in animal development and genetics at the cellular and molecular levels. Some researchers investigate the genetic programming behind cellular processes as cells develop, while others explore the genes that control growth and obesity, stimulate stem cells to become specialized body parts, and perform many other functions. Geophysical Laboratory, Washington, D.C. Researchers at the Geophysical Laboratory (GL), founded during 1905, examine the physics and chemistry of Earth's deep interior. The laboratory is world-renowned for petrology—the study of rocks. It is known also for high-pressure and high-temperature physics, having made significant contributions to both Earth and material sciences. The GL, with the Department of Terrestrial Magnetism co-located on the same campus, is additionally a member of the NASA Astrobiology Institute—an interdisciplinary effort to investigate how life evolved on this planet and determine its potential for existing elsewhere. Among their many projects is one dedicated to examining how common rocks found at high-pressure, high-temperature hydrothermal vents at the ocean bottom may have provided the catalyst for life on this planet. Research at the Geophysical Laboratory is multidisciplinary and encompasses research from theoretical physics to molecular biology. When the Laboratory was first established, its mission was to understand the composition and structure of the Earth as it was known at the time, including the processes that control them. This included developing an understanding of the underlying physics and chemistry as well as the tools necessary for research. During the history of the Laboratory, this mission has extended to include the entire range of conditions since the Earth's formation. Most recently this study has expanded to cover other planets, both within our own solar system and in other star systems. Presently, as through its history, the Laboratory develops instruments and procedures for examining materials across a wide range of temperatures and pressures — everything from near absolute zero to hotter than the sun and from ambient pressure to millions of atmospheres. The Laboratory uses diamond-anvil cells coupled with first-principles theory as research tools. It also develops scientific instrumentation and high-pressure technology used at the national x-ray and neutron facilities that it manages. This work addresses major problems in mineralogy, materials science, chemistry, and condensed-matter physics. Laboratory scientists examine meteorites and comets to follow the evolution of simple to complex molecules in the solar system. They are gaining insights into the origin of life by examining the conditions present in the early Earth. Studying unique ecologies to develop detailed models of their biochemistry helps develop protocols and instrumentation that could assist the search for life on other planets. The protocols and methodologies are tested in regions of the Earth that serve as analogs for conditions found on other planets. As do all Carnegie departments, the Laboratory funds outstanding young scholars through a strong program of education and training at the pre-doctoral and post-doctoral levels. Department of Global Ecology, Stanford, California Established during 2002, Global Ecology is the newest Carnegie department in more than 80 years. Using innovative methods, these researchers are researching the complicated interactions of Earth's land, atmosphere, and oceans to understand how global systems operate. With a wide range of instruments—from satellites to the instruments of molecular biology—these scientists explore issues such as the global carbon cycle, the role of land and oceanic ecosystems in regulating climate, the interaction of biological diversity with ecosystem function, and much more. These ecologists also play an active role in the public arena, from giving congressional testimony to promoting satellite imagery for the discovery of environmental "hotspots". During 2007, former Department Director Chris Field was among the 25 scientists who accepted the Nobel Peace Prize on behalf of the IPCC, which shared the award with former Vice President Al Gore. The Department of Plant Biology began as a desert laboratory during 1903 to study plants in their natural habitats. Over time the research evolved to the study of photosynthesis. Presently, using molecular genetics and related methods, these biologists study the genes responsible for plant responses to light and the genetic controls over various growth and developmental processes including those that enable plants to survive disease and environmental stress. Additionally, the department is a developer of bioinformatics. 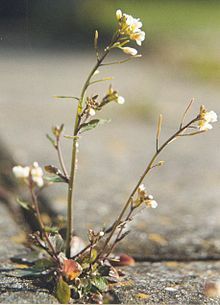 It developed an online-integrated database, The Arabidopsis Information Resource (TAIR), that supplies all aspects of biological information on the most widely used model plant, Arabidopsis thaliana. The department uses advanced genetic and genomic methods to study the biochemical and physiological basis of the regulation of photosynthesis and has pioneered methods that use genetic sequencing to systematically characterize unstudied genes. It investigates the mechanisms that plants use to sense and respond to light including the blue light receptors that drive phototropism, the direction of growth towards light, and chloroplast positioning as well as the molecular mechanisms that shape the plant body, especially the production and shape of leaves. It also examines life in extreme environments by studying communities of photosynthetic microbes that live in hot springs. Department of Terrestrial Magnetism, Washington, D.C. The Department of Terrestrial Magnetism was founded during 1904 to map the geomagnetic field of the Earth. A crucial part of this mission included the use of two ships. The Galilee (ship) was chartered during 1905, but when it proved unsuitable for performing magnetic observations, a nonmagnetic ship was specially commissioned. The Carnegie (ship) was built during 1909 and completed seven cruises to measure the Earth's magnetic field before it suffered an explosion and burned. Its captain was J. P. Ault. Over the years the research emphasis of the department changed, but the historic goal—to understand the Earth and its place in the universe—has remained the same. Presently the department is home to an interdisciplinary team of astronomers and astrophysicists, geophysicists and geochemists, cosmochemists and planetary scientists. These Carnegie researchers are discovering planets outside the Solar System, determining the age and structure of the universe, and studying the causes of earthquakes and volcanoes. With colleagues from the Geophysical Laboratory, these investigators are also helping to define the new and exciting field of astrobiology. The department funds a number of interdisciplinary research studies. Astronomy and Astrophysics at DTM uses pioneering detection methods to discover and understand planets outside the Solar system. By observing and modeling other planetary systems, researchers are able to apply those implications to our own system. The Geophysics group at DTM studies earthquakes and volcanoes and the Earth's structures and processes that produce them. Cosmochemists study the origins of the Solar system, the early evolution of meteorites and the nature of the impact process on Earth. Astrobiological research focuses on life's origins and chemical and physical evolution from the interstellar medium through planetary formation. Giant Magellan Telescope, artist's conception. The Observatories were founded during 1904 as the Mount Wilson Observatory, which transformed our notion of the cosmos with the discoveries by Edwin Hubble that the universe is much larger than had been thought and that it is expanding. Carnegie astronomers presently study the cosmos. Unlike most researchers of their topic, they design and build their own instruments. They are tracing the evolution of the universe from the spark of the Big Bang through star and galaxy formation, exploring the structure of the universe, and probing the mysteries of dark matter, dark energy, and the ever-accelerating rate at which the universe is expanding. Carnegie astronomers currently operate from the Las Campanas Observatory, which was established during 1969. Located high in Chile's Atacama Desert, it affords excellent astronomical observing conditions. As Los Angeles's light encroached more and more on Mount Wilson, day-to-day operations there were transferred to the Mount Wilson Institute during 1986. The newest additions at Las Campanas, twin 6.5-meter reflectors, are remarkable members of the latest generation of giant telescopes. The Carnegie Institution is currently partnered with several other organizations in constructing the Giant Magellan Telescope. During 1989, Maxine Singer, president of Carnegie at that time, founded First Light, a free Saturday science program for middle school students from D.C. public, charter, private, and parochial schools. The program teaches hands-on science, such as constructing and programming robots, investigating pond ecology, and studying the Solar System and telescope building. First Light marked the beginning of CASE, the Carnegie Academy for Science Education. Since 1994 CASE has also offered professional development for D.C. teachers in science, mathematics, and technology. The Carnegie Institution's administrative offices are located at 1530 P St., NW, Washington, D.C., at the corner of 16th and P Streets. The building houses the offices of the president, administration and finance, publications, and advancement. During 1920 the Eugenics Record Office, founded by Charles Davenport during 1910 in Cold Spring Harbor, New York, was merged with the Station for Experimental Evolution to become the Carnegie Institution's Department of Genetics. The Institution funded that laboratory until 1939; it employed such anthropologists as Morris Steggerda, who collaborated closely with Davenport. The Carnegie Institution ceased its support of eugenics research and closed the department during 1944. The department's records were retained in a university library. The Carnegie Institution continues its funding for legitimate genetic research. Among its notable staff members of that topic are Nobel laureates Andrew Fire, Alfred Hershey, and Barbara McClintock. ^ Ris, Ethan W. (2016-12-20). "The Education of Andrew Carnegie: Strategic Philanthropy in American Higher Education, 1880–1919". The Journal of Higher Education. 0 (3): 401–429. doi:10.1080/00221546.2016.1257308. ISSN 0022-1546. ^ "Measuring Worth - Relative Worth Comparators and Data Sets". www.measuringworth.com. Archived from the original on 2016-08-18. ^ Trefil, James; Margaret Hindle Hazen; Timothy Ferris. Good Seeing. Joseph Henry Press, 2002, pp. 29-31. ^ Trefil, James; Margaret Hindle Hazen; Timothy Ferris. Good Seeing. Joseph Henry Press, 2002, pp. 201-205. ^ Trefil, James; Margaret Hindle Hazen; Timothy Ferris. Good Seeing. Joseph Henry Press, 2002, pp. 77-79. ^ "Chris Field: A Man for All Climates". Archived from the original on 2016-06-11. ^ "Light to Life". dpb.carnegiescience.edu. Archived from the original on 2016-06-11. ^ Trefil, James; Margaret Hindle Hazen; Timothy Ferris. Good Seeing. Joseph Henry Press, 2002, pp. 133-136. ^ "Research - DTM". dtm.carnegiescience.edu. Archived from the original on 2016-06-12. ^ "History". The Carnegie Observatories. Archived from the original on 2016-07-26. Wikisource has the text of the 1920 Encyclopedia Americana article Carnegie Institution of Washington. Historic American Engineering Record (HAER) No. DC-52-A, "Carnegie Institute of Washington, Department of Terrestrial Magnetism, Standardizing Magnetic Observatory"
HAER No. DC-52-B, "Carnegie Institute of Washington, Department of Terrestrial Magnetism, Brass Foundry"
HAER No. DC-52-C, "Carnegie Institute of Washington, Department of Terrestrial Magnetism, Atomic Physics Observatory"